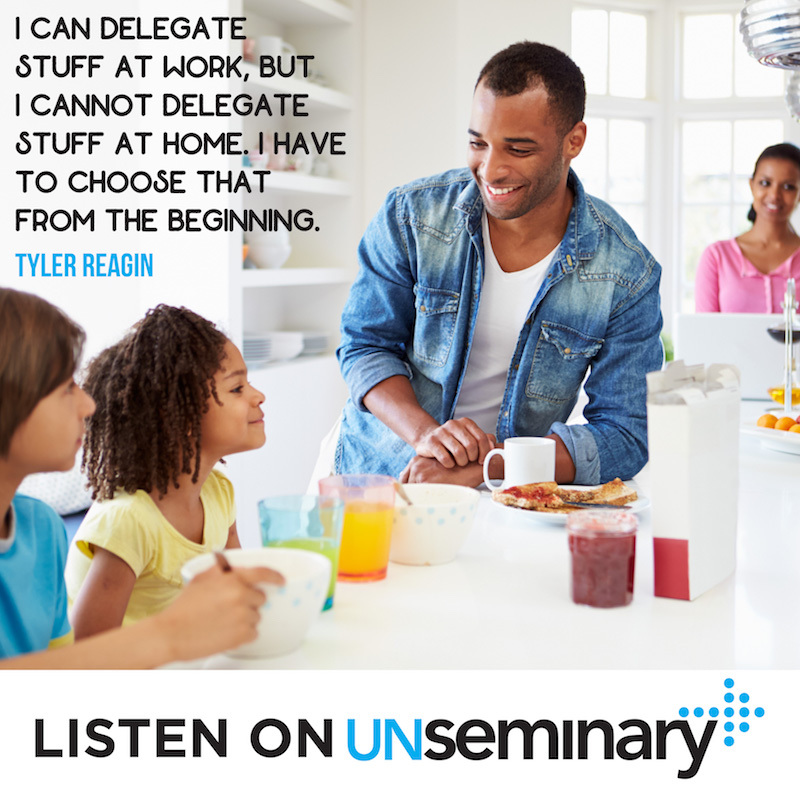 Hello and thank you for joining us for this week’s unSeminary podcast. We’re super excited this week to have Tyler Reagin with us from Catalyst. The Catalyst organization runs Catalyst Conferences around the country. The organization was started about 16 years ago by John Maxwell, who wanted to connect and invest in the next generation of leaders in addition to the generation that was already attending his events. Along with a few other men, they began Catalyst Conferences and One Day Events across the country which target the 40 and under generation of church leaders. Today Tyler is here to talk about the pressures that young church leaders face regarding work-life balance and how to best confront them. Cheat work, not your family. //There just aren’t enough hours in the day to do everything, and we weren’t meant to do it all. You’ll have to cheat somewhere in your life, Tyler points out. If you choose to cheat your family over work, that’s a bad decision. If you choose to cheat your health over work, that’s a bad decision too.Oftentimes when young leaders are single, they choose to pour themselves into their work, believing they can figure out a work-life balance when they get married down the road. But the time to learn to set healthy boundaries is now. You can delegate things at work to other people, but you can’t delegate at home. Figure out a schedule and a system that works best in order for you to be there for your important relationships, whether family or friends, even if that means going to work earlier so you can leave by 4pm. Find healthy ways to relieve stress. // Everyone will deal with stress in their lives. The question is will you deal with the stress in a healthy way or an unhealthy way? Stress can easily lead to negative habits such as overeating, drinking too much or sitting in front of the TV for hours. Instead, find ways to be a good steward of your life and body while also relieving that stress. For Tyler, that stress relief is golf. He gets to spend time with friends, and during the game his mind is on golf and not on work. Church leaders need to make time for fun in their lives, or they won’t be any good for the congregation. What would you encourage a member of your church body to do? You should follow your own advice! You can connect with Tyler on Twitter @TylerReagin or Catalyst @CatalystLeader. You can also learn more about the Catalyst Organization at http://www.catalystconference.com. 00:37 // Rich introduces Tyler Reagin and welcomes him to the show. 01:13 // Tyler introduces us to Catalyst. 03:45 // Tyler highlights and talks about the pressures of ministry. 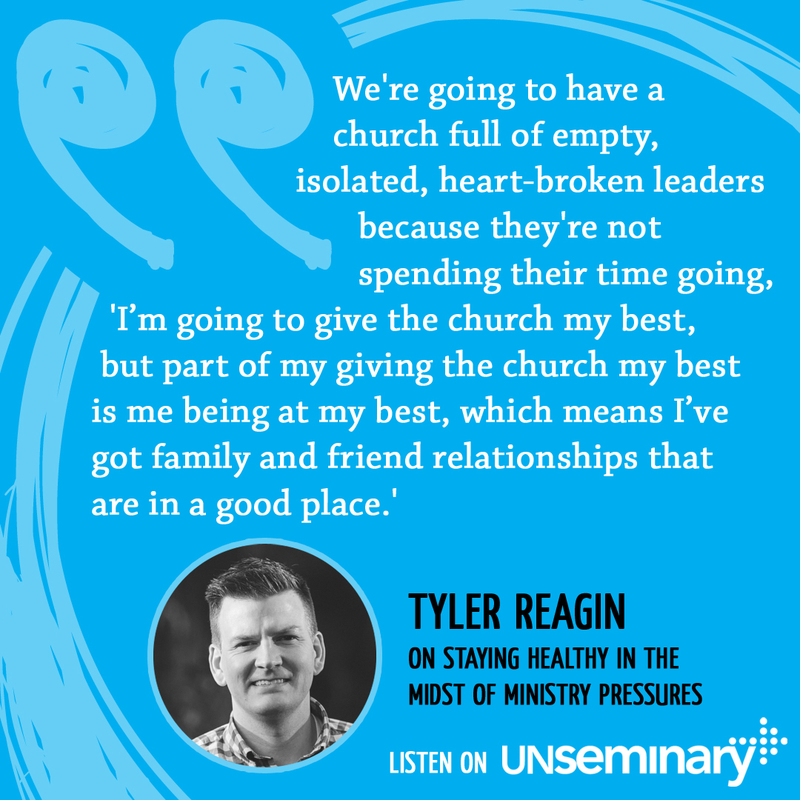 06:05 // Tyler talks about the pressures and difficulties of maintain physical health in ministry. 10:33 // Tyler offers practical advice on achieving a healthy schedule. 13:57 // Rich and Tyler discuss healthy ways to relieve stress. 19:27 // Tyler talks about some of the events at Catalyst. Ministries Following // Hillsong. Steve and Charlotte Gambill, LIFE Church, UK. Influential Book // Leaders Eat Last by Simon Sinek. Rooted: The Hidden Places Where God Develops You by Banning Liebscher. Originals: How Non-Conformists Move the World by Adam Grant. What does he do for fun // Drinking sweet tea. Just having fun. Rich – Well hey everybody, welcome to the unSeminary podcast, my name’s Rich, super glad that you’ve decided to listen in today. You know, every week we try to have different leaders and from other organizations who we think will provide great value to you and today is no exception. Super excited to have Tyler Reagin with us from the Catalyst organization. They run Catalyst Conference One Day Events all across the country, a great organization, they’ve done incredible things, also his blog, he’s a consultant, a great guy and I’m super excited to have you on the show today Tyler. Tyler – It’s great to be here Rich, thanks for having me. It’s like taking me back to my seminary days, by just saying unSeminary it makes me a little nervous, so I’m good with it. I think if was the official unSeminary student of our seminary. Rich – Well that’s good, well then you’re among friends, that’s a great thing. Well for folks that don’t know, kind of tell us the Catalyst story, what is Catalyst? Tyler – Sure, so about 16 years ago a guy named John Maxwell, some people have heard of him, it’s amazing these days that we interact with. John decided as he was getting older, and so were the people attending his events and he thought, “I want to make sure I always connect and invest in that next generation of leaders.” So he tapped a young guy named Andy Stanley on the shoulder and said, “Hey, why don’t we try this thing together?” and at that time North Point was only four or five years old and Andy was known more probably as Charles Stanley’s son and not necessarily like this leadership guru that a lot of people look at him now. So they started him and Reggie Joiner and a guy named Gabe Lyons and they started a once a year event for 40 and under basically was the program target audience and I would say then it was really church leaders who were staff and those kinds of things and over the years we’ve added events. Now we do, this year, 2016 we’ll do 11 events this year. Atlanta is still our big once a year event, we have about 10 thousand leaders join us at the arena here and then throughout the year we do six or seven Catalyst One Days with Craig Rochelle and Andy Stanley, just super practical, four sessions, one-day worth of content on time management, leading your family well, some of the stuff we’re talking about today. And that’s where mostly executive teams and that sort of thing can come because it’s regional and it’s affordable. But then we do these three, Two Day Events, California; Catalyst West in the Spring, Catalyst Cincinnati and Catalyst Atlanta and that’s more the big picture, inspirational, unity, what does that look like for us as a church? So this year we’ll have about 30 thousand people at our events and what a privilege it is to get to lead leaders, I think it is one of the greatest callings, I know it’s the greatest calling in my life, but the fact that maybe there’s 30 thousand people, they represent well over a million people who are impacted by that. So yeah, we try to serve leaders who love the church, so now our demographic has really adjusted to be about 40/60, 40% market place leaders, 60% pastors. Rich – That’s really cool. Well you obviously have an insight into leaders across a wide spectrum, in all different churches and backgrounds and emerging leaders and leaders that are trying to pass things onto the next generation. What would you say are some of those pressures that church leaders face? I would think you’ve got to be running off your feet trying to do all, that just tires me to think of all those events. What would you say are some of those pressures that church leaders are facing, particularly on a regular basis? I think it’s that and I think the other huge thing that ministry will always have and carry with it is, do I sacrifice my family on the altar of ministry? Am I going to give up my friendships because God’s called me to be a pastor? Where we’re unhealthy as leaders, that is a constant tension, it’s got to be for leaders and pastors, “Oh gosh, I know I should be eating healthier, I should be exercising,” well that’s not an option, and I don’t think God’s ever called any of us to sacrifice our health or our families to make sure the church has an extra five people there. I’m making slight of it, but you understand what I’m saying, there’s a realness to the health of leaders that dictates the health of their church. Rich – So true. We’re in a season, I just happen to be in a season of ministry where I was literally just thinking that this week, where I ended up at Smashburger three times this week. Rich – And there’s just a lot going on, I think a lot of church leaders, they are busy, running off their feet, running from one thing to the next. I’d love to hear how you’ve been able to deal with that. How either you or your ministry of how you’ve seen other folks deal with all those pressures, there’s so much going on, how do we stay healthy in the midst of the pressures of ministry? Tyler – Yeah, you know even as a leader, leading a team of 25, I’m really passionate that part of my job, I hire them because they’re competent, I hire them because they’re good at what they do. My job as a leader in this organization is to make sure they stay healthy. If I can help them stay healthy, emotionally, physically, spiritually, they’re going to kill the job, I don’t have to worry about the job. I spend more time Rich telling people to go home than I do stay late, because I know they’re going to get the job done, these are dedicated, hard-working, tireless people, if they’re not, they’re not going to be here long anyway. Rich – Right, they’re going to stick out. Tyler – And bigger than that, the healthier you are outside of this building, the better you are for me inside of this building. Rich, I just turned 40 this week. Rich – Nice, welcome to the 40s. Tyler – I know, I’m in an interesting season, I’ve been a little bit nostalgic thinking back at it, because I just cannot believe that I’m at that point, but physical health, it’s one of the things where I go, I’ve got two boys that are six and nine, my wife of 15 years, like they need me to be in good shape and my personality is one that if it’s just me, I don’t care, like I really couldn’t care less personally, but as soon as those eyeballs of those little boys and my wife come into my mind, my motivation changes and it should for all of us. Rich – That’s too convicting. Tyler – Yeah I know, I mean nurses and doctors are the worst patients, right? Tyler – It’s the same thing with us. Sometimes we’re the most unhealthy and we’re telling people, like God’s calling you to be healthy. So I think it’s amazing, people think in spite because it [Inaudible 00:09:33], I think it’s in spite because of health. What would you say to a leader today, let’s just get super practical, how can they begin to set some boundaries and kind of create some healthy rhythms in their life that really point in the right direction? Tyler – Yeah, you’ll hear me Rich talk about Andy Stanley a lot, mainly because I worked at his church for ten years and I still go there. So I feel like he’s in my brain a lot but it’s a good person to have in your brain. Rich – Stuff happens, yeah. Rich – “Come on, let’s go,” exactly. Tyler – You try to schedule an 8:30 meeting and you see their face like, “Oh my god, what am I going to do?” “Okay, that means guys, we’ve got a six-hour window to have our face to face meetings, other than that, I’ll see you tomorrow, right?” There just had to be some understanding of what that looked like. Now their schedule, it worked better for them, I don’t have a problem with that, that’s great, but each of us have to recognize that like, I’ve got to figure out how to cheat appropriately in my family or with my job, to get to the place that I need to do. Another thing, and this is super practical for me Rich, Dr. Sam Chan talks about this, Dan Allender talks about it, all these guys who have studied or dealt with burnout and those sorts of things. A boundary that has to happen is every one of us are going to deal with stress, we’re going to deal with it. We get to choose whether we deal with it healthy or non-healthy. Rich – Oh that’s good, that’s good, that’s good. Tyler – Are we going to let just whatever… It’s like a budget, I can choose where my money goes or it’s just going to go somewhere. Tyler – Stress is just going to tend to go towards negative things; overeating, drinking too much, whatever the different things are, taking the wrong times, or I can choose to release stress in the ways that God’s wired me, maybe it’s walking outside, maybe it’s exercise. For me personally, it’s golf, like that’s one of those things in my life and the reason is to be frank, it’s the only thing I do that I don’t… it forces me to think about something, do you know what I mean? Tyler – So when I go on a golf course I’m having to think about golf. Now I’m with my buddies and we’re having fun, but very rarely in a four-hour round will I think about work. Tyler – It’s honestly one of the only breaks that my brain ever takes, because when you leave something that weight never goes away. I don’t have a job that when I leave at 5 o’clock I quit thinking about it because I put the drawer in and I pick it back up the next morning. Rich – Right, right. Same way. Rich – Ah, that’s cool, yeah. Yeah, that’s very cool. Tyler – But for me I’ve always knows that I’ve got to have some fun in my life or I’m not good to anybody. Rich – Right and that’s super important I think, leaders need to find those things and they’re going to be different for everybody and it may not be golf, I know in my own life, for years I was like, I could never really get to the gym, I’m not really a gym guy. Rich – But then something clicked, probably a year and a half, two years ago, where now if I don’t go to the gym in the morning, life doesn’t work well for me. Rich – A big part of it to be honest, it’s more the mental disconnect from everything else than the actual working out. The working out’s important, but it’s a time for me just to kind of disconnect, put my headphones on, I listen to a bunch of podcasts that don’t have anything to do with what I do in life. Rich – And it does, it feels like, that’s an hour, an hour and a half of disconnect time that I need, I need that for sure. That’s good. What else, what else should we be thinking about? Rich – No, that’s so true. Craig Rochelle talks, he’s a friend of ours and I don’t know if you’ve seen Craig lately, the number one question we get with Craig is how many pushups can Craig do? Rich – That’s crazy, yeah. Tyler – “But this is a spiritual thing.” I mean, I’m saying, please hear me, I’m not saying this as… I had a lot of fried chicken yesterday. Tyler – I grew up eating that stuff and to me a diet change is a massive undertaking based on what I grew up on and up until five years ago it didn’t even affect me, I was skinny and then all of a sudden, wow! Tyler – Yeah, but I know for me this is not just a discipline thing, this is very much a spiritual thing that I’ve got to lean into. So I can talk about it and I feel the weight every time I talk about it because I want to make sure that I’m not just saying it and not doing it. So I don’t know, I just think it’s an epidemic sometimes in our churches, in our ministries, that our leaders aren’t healthy in the ways they need to be healthy. Rich – Well anything else you want to share before we jump into the lightning round? How is Catalyst helping leaders with these sorts of issues, are you injecting this kind of messaging into your programming? Tyler – Yeah for sure, the One Days specifically. Tyler – We talk time management, family matters, we’re talking about how to speak to staff, how to lead staff. So we say we exist to unify, equip and challenge leaders who love the church. Really our One Days, we working on like a work book, we working on some leadership development tools or app. The content we create is really that equipping piece of the puzzle. The Two Day events we do are really that unify and challenge. Because we’re not a church and a denomination, we get to kind of sit in the middle a little bit and put. I mean you’ve been to Catalyst, one of the things that represents Catalyst really well is progression. It’s a group of people that’s not okay with doing things the way we’ve always done things. Tyler – So we’re going to put people on stage you don’t agree with theologically, because you need to hear what they have to day. Tyler – They’re leading something that’s incredible and God’s blessing it even though you’re going, “How can you bless that?” They do a lot of baptism. “What?” They all do, you know what I mean, like sprinkle or emersion or they’re Anglican, “What? How can that be?” Wow, it’s amazing, God does amazing things through his church and it looks very different. So for me, we’re trying to 365 days a year encourage leaders who love the church to be leaders worth following, to be the leaders that you’re not leading because you’re a positional leaders, you’re leading because people want to follow you.